A principle is a fundamental rule for conduct or thought. Paul says I find the principle (Greek nomos – law) that evil is present with me (Romans 7:21). Indeed principles are often law-like. One biblical principle relates to the limits of knowledge. Job 28:20-28 “Where then does wisdom come from? And where is the place of understanding? Thus it is hidden from the eyes of all living . . . God understands its way, And He knows its place. For He looks to the ends of the earth and sees everything under the heavens. When He imparted weight to the wind and meted out the waters by measure, When He set a limit for the rain And a course for the thunderbolt, Then He saw it and declared it; He established it and also searched it out. And to man He said, ‘Behold, the fear of the Lord, that is wisdom; and to depart from evil is understanding. '” Even a child can see the marvels of nature and recognize the handiwork of the Creator in the things made. Yet nature contains mysteries that exceed our understanding – it is hidden from the eyes of all living. Another biblical principle explains why humanist science fails. Paul, in Romans 8:19 – 22, explained that the creation was subjected to inutility because it is enslaved to change (Greek phthora). The Greek philosophers used this word (phthora) for ongoing, fundamental change. Paul used two orderly submission verbs and two together verbs to explain the creation’s degeneration. Things that change in an orderly, together way – change relationally. Relational change is when no aspect of reality is unaffected by the change because fundamental things change in parallel, together. The evidence for relational changes in matter is visible in the only history that we observe as it happened, galactic history. The earliest galaxies were often naked, without starry appendages. Their light clocks shone at less than 10% of the frequencies emitted by modern atoms. We observe tiny globs packed with stars coming out from countless ancient galactic cores in equally spaced chains. The star globs rotate outwards over cosmic history, spreading into huge, local, growth spirals. According to the fourth creation day, He continues to form the Sun, Moon and stars and continues to ake them into things that spread (raqiya). He continues, in unbroken continuity, to call the stars to come out, yet none go missing (Isaiah 40:22 and 26). The principle of change is confirmed in cosmic history and in local geology. According to the Bible, the Earth spreads out in unbroken continuity and this happens above the waters (Psalm 136:6). Indeed, a global expansion seam runs through every ocean. We know it is a spreading seam because new seafloor forms as molten lava emerges and hardens into fresh, basaltic crust. The continents only fit together on a tiny globe. 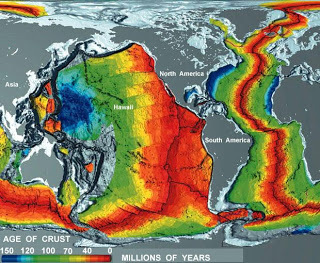 The seafloor is younger than the continents. The youngest seafloor is adjacent to the global expansion seam. The continents are covered with layers of crushed sedimentary rock but the abyssal plains are covered with marine oozes, the thinnest layers of ooze are adjacent to the expansion seam and the thickest near the continental margins. The layered sediments in the subduction zones show that the theory of subduction is a scientific myth, invented to protect their fundamental creed. The map of the relative seafloor ages is from NOAA. The youngest Earth crust is red and the oldest is deep blue on this map. The Hebrew text of Zechariah 12:1 says that in unbroken continuity He continues to lay the foundations of the Earth. Isaiah 42:5, in unbroken continuity He continues to stretch out the Earth and that which is born (or issues out) from the Earth. In Isaiah 44:24, He is actively, in unbroken continuity, spreading out the earth, which is evidence for what He alone can do. The principle of universal change is why scientists can never decode earth history. The picture of the growing earth is from Michael Netzer. It is licensed under the Creative Commons Attribution-Share Alike 3.0 Unported license.